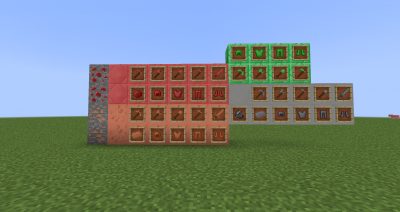 More Ores Craft is a new version of Copper and Ruby Craft. This mod adds Copper, Ruby, Steel, Emeral tools, Emerald Armor, new crafting recipes, tools and armor. Copper and Ruby's Crafting is the same as in Copper and Ruby Craft mod. Steel's crafting looks like: put iron ignot and coal in Crafting Table, then coal and iron mix must go to the furnace, now you have steel ignot. Emerald Tools And Armor is normal crafting tools and armor but with emerald, it's finnaly more useful. Please write comments about what can I change or add in this mod. I'll be Thankful if you decide to rate this modification. @#1 @#1 What you think ? should i add dyed planks and maybe colored redstone lamps ?